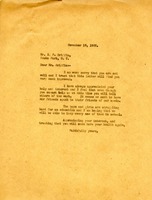 Letter to Z. F. Griffin from Martha Berry informing him that she hopes that this letter will find him in better health. She informs him that she has always appreciated his help as well as his interest and although he can't help the schools at this time she hopes that he will informs him friends of the work that the schools are doing. She informs him that the boys and girls are working hard in school and that she hopes they can all stay in school. In closing, she once again hopes his health will have improved.